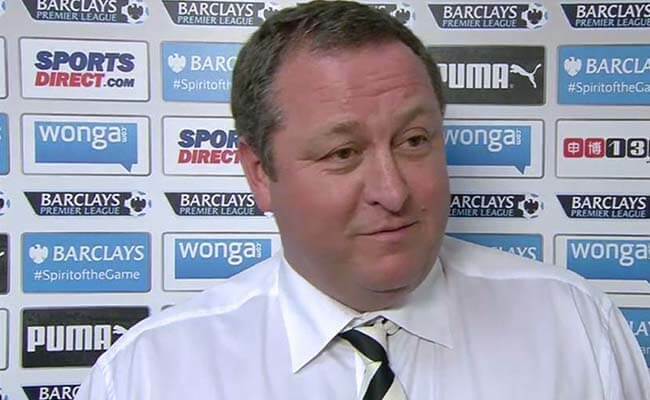 One of the statements Mike Ashley made in that Sky Sports interview just before the West Ham game on 24th May that seemed important – was that from now on we were going to make our own luck. Q: Would you invest so much that it comes straight back up from the Championship? There have been promises before of course, but this is starting to look like the real thing. Assuming we can sign Chancel Mbemba for £8.5M tomorrow, then Newcastle will have spent around £35M on three top players in Gini Wijnaldum, Aleksandar Mitrovic and Chancel Mbemba, and they will no doubt improve the team. And maybe three more top players are still to arrive this summer. Things definitely at least feel as though they are picking up at the club, and Steve McClaren has made a huge difference with his experience and savvy as he tries to pull everybody together at the club – including the fans – since he arrived last month. His willingness to engage the fans at the last Fans Forum meeting was eye-opening and like a breath of fresh air to frustrated fans. Newcastle still have it all to do on the field next season of course, and that’s all that really matters, but the mood of Newcastle fans seems to be starting to change for the better. It even looks like from now on we will be making our own luck. I sincerely hope Pardew is looking on with envy at this current spending spree at newcastle and the realisation Mashley has him sussed a while ago and would never have trusted him with this kind of spend. Happy to take on any bets we’ll finish above palace this year and it’s nice to see most toon fans hate Palace nearly as much as the Makems. If he can’t start ahead of Matip, then it would tell me that Nastasic hasn’t improved significantly from the error prone youngster City had. nastasic would be great..tall, young experienced, talented..and non african 🙂 probably best of all suggested defenders…but i think we bid for him last winter and he rejected us? I don’t hate Palace in the slightest. They are a cracking family club, and have a great ground to play in for atmosphere and the proximity of the stands. I hope Pardew can keep their heads above water this year, if they can keep Bolasie and Cabaye fit then they can do okay, particularly if Bamford can transfer his goals to the Prem. What input do you think McClaren has had on potential incoming transfers? Wijnaldum was a long term target, according to Mbemba’s agent we have been watching him and Mitrovic for the best part of a year. Most of our other alleged targets are players we have been linked with for a year or more. But what about the ‘surprises’ McClaren speaks of, Lilongwe? Good point about the ACON not being until 2017 which would buy us time by then Lascelles, Good or Satka would have matured into centre backs or been discarded. Also Dummitt may have become a permanent centre back or not. Also Williamson and Saylor would possibly be too old by 2017. I think ‘He Will Rise Again ‘ @ 28 has a good point. I would be astonished if McClaren consents to the club buying another international African centre defender knowing what the consequences could be in the middle of the season. I think you’re thinking of Safic. He was the error prone one who City swapped with Nastasic. It was Pelligrini who chose experience over youth. Nastasic was sold and they brought in Mangala. He has been injured for Schalke and that has hampered his ability to challenge Matip and Howdes. But come on man, we’re talking about Matip and Howdes. Not many 22 year old CB’s in world football could get into a team with them in it. I think it could be him and I for one would welcome it. And Kingsley Colman as well. Him and Aaron’s would annihilate average full backs week in, week out. Also, anyone think that Sofiane Feghouli could be one of the under the radar players. We have been linked with him in the past, is the right age for us at 25, at Valencia, so Cathro will know him well. Creative attacking midfielder who can play through the middle or wide right. Right, here’s a scenario. Ashley pumps loadsa money in over the next two windows after this one and we win a cup and are fighting for a CL spot. Do we still want him out? I feel strange saying that after all the nasty things I’ve said about him, but let’s be honest, winning stuff would be nice and if it’s with his financial backing, would we really want him to sell up to an unknown? What a dilemma. Whilst I still can’t help coming over all Neanderthal about the Makems ( you can take the lad out of But you can’t take FTT out of the lad) I personally don’t hate Palace or any team. I’m also not that fussed about Narcissus, sorry Pards. Everybody else can get on and do their thing, have good season. I personally really need to feel connected to my team again, and to look forward to games. Know what? I do and I am. Coming on here helps, but mainly it’s the obvious: a professional set-up at coach/manager level, and sensible investment. Yeah, you could be right on Savic. However Matip is poor. He lacks concentration and positional sense. I’d be very disappointed if he came here. Anyway, Nastasic only signed for them this summer officially. He certainly wouldn’t be available to buy. I would imagine that the club would have said to McClaren when appointed that he will have a major input to future transfers but not those currently earmarked by Carr unless he has a very serious objection. I would imagine he has the greater influence on who will be sold. Lilo – McClaren himself said there was a plan in place before he came to the club and since then that plan has been slightly amended but not greatly. On top of that you have Carver talking about the plan and the players ‘we will not believe’ this summer. They were always going to spend this summer due to the amount of contracted players nearly out of contract……but this was made more necessary with the squads performance last year…….think it may have encouraged them to spend a tad more and I do think McClaren, due to his relationship with Carr will have pushed some players forward and probably made the list somewhere. I’d guess Feghouli would fit in that surprise bracket. Other than that, I’d hope it is a dominant leader at the back with Premiership experience. I think we’d all want him to stay even if it makes us look fickle to other fans. It’s never been personal other than the times he made it personal. The thing we’ve always asked for is a team that tries not a team that wins. Even if we invested year on year with a look to improving, finished top 10 in the next few seasons and played good football most people would forgive him, even if we didn’t win anything. I’m only jesting but what a signing that would be!!! For me, if it is going to be a big signing, the main candidates are Ruttiger, Toprak and Nastasic – the majority of other good defenders in the Bundesliga are either too old (Naldo) or wouldn’t join us ever. Ashley can only pump money into the club if he went back on his view that the club should be self financing which it currently is and also within the limits imposed by the European Fair Play Rules that his finance boys can come up with. It is unlikely but it happens a lot in Europe where clubs activate a purchase agreement from a loan in order to have control over the transfer fee of a player. If for example Schalke paid £8 million and sold him for £10 they’ve made £2 million for no work really. If Ashley proved over time that he was now putting the club first, and consistently drove it forward I think all would come round to him. The fact is there are 8 years of distrust to repair, and it will take far more than one summer window for that too happen. I’ve stated that until I see us make continuous progress, and see that we don’t self inflict damage upon our season in a January window at least twice I will remain cautious. I’ve always been happy to give people a chance but they have to prove they have changed long term, and it isn’t a flash in the pan. Trust is earned, and not given freely. Everyone has the clubs best interests at heart. People go about it in different ways, and have different views, but there is one common goal. A club that we can be proud of. If it is a club we can be proud of AND we are picking up trophies, even better. Altamullen, funny old game football. Love and hate all mixed together as only football can. Me, I can’t wait for the season to begin, I’m genuinely excited like I used to get in the seventies when I was just a lad (cue the hovis advert music). We’ll be no pushover this season and we need to get SJP back to the fortress it once was. Whilst Ashley is in a bridge building mood, he needs to open up a singing section again. I would be genuinely amazed if we don’t have stronger interest in Douglas this window… we’ve tracked him for years now and McClaren adored him at Twente and tried to sign him when he was at Wolfsburg. If Ashley has had an epiphany and puts the investment into winning a cup, and at the same time wins the fans over with his engagement, how is it fickle of us to be turned around into dropping the Ashley Out agenda? Surely that would be one of two desirable results? Either he leaves to be replaced by a more enthusiastic and forward thinking owner, or he stays and gets his act together. If the latter turns out to be the case it’s a victory for all concerned, and a vindication of the process that got it there. I couldn’t care less about the SD advertising or MA if we were attempting to be successful and were making good money. I mean this even on a self financing level. We sold Cole to get Ferdinand and Gillespie, its what happens. However, it is about building a side consistently over windows, having players for a few seasons selling at top whack and bringing in quality players to replace (before they are sold) so they will hit the ground running. I will never want MA here, at least thats how I feel at this point……but he could be ignored in the right circumstances. I’m a bit more basic than some of you lads…I hate Pardew with a passion and anything he touches. He’s a fake and deserves to be outed at every opportunity. Once Palace Sack him I’ll always be pleased to see them do well. I would not be surprised if the surprise was due to the influence of Cathro and the surprise comes from Valencia and the player would want to come here because of Cathro. Feghouli only has a year left on his contract, Otamendi as CB and Gaya as LB would be a nice surprise. If it was Otamendi he would settle quickly because of Colo but anyone else they would maybe do a double swoop again to help settle the players quickly as they have just done. I’m not sure it happens a lot. Maybe a handful of cases. It won’t be happening in this case though. Just checked and he played 90 minutes in 16 out of 17 games after arriving at the club. No way is he available to move again. Its a done deal with those eyebrow movements. Announced next week I heard. On a serious note, I love the optimism, but does anyone else feel the surprise may be of the bad kind? And not good… AKA, signing sol campbell to fix our defensive woes…or signing Joe Kinnear as the new MD…? Personally, I can’t see myself ever feeling comfortable with Ashley. I accept, I don’t know him, but what I infer (SD zero hours; SJP name change; Badge of Shame sponsorship) leads me to conclude he is a very good business man, with a particular business model for the club, who has very poor values, and surrounds himself with the same. Hope I am wrong about the latter, that he is misrepresented in the press, is really lovely etc etc. Just don’t think I am. I’d rather have someone, doesn’t have to be a Geordie, who is more in the mid range on all of the above. Someone I think loves the club and is a safe pair of hands for all it means to people. I have to say I will never forgive him or forget some of the things that have been said. This is the first time he has looked like changing things at Newcastle for the better, and has rightly got the fans excited myself included. But there is always that underlying currant that could pull us back down, sales in January without replacement will be one to watch out for. Certain things stick in a man’s memory, for example Llambias saying “They don’t know how nasty we can be”; Charnley saying “he will have to accept player sales without replacement”; or Ashley himself saying, ” Newcastle United and Rangers are beneficial to Sports Direct”. He is not spending all this money for the fans, or the team he is spending because he has to, he has to build a team that can perform on the pitch, (good for the fans) and keep us in the league, but his single minded purpose is to keep Newcastle feeding his SD tat shop. It’s not blind hatred of Ashley, it’s cold and calculated to the exact extent of his treatment to Newcastle United and it’s fans. Regarding ‘surprise signing’ Ryder speaks of. Before we even sign anymore non-EUs you’d think one or two will be on their way out as I’m sure you’re only allowed 4 or 5? Noticed He Will Rise mentioned Nastasic and obviously he’s Serb so that would be another to the list. I’m fairly sure any further signings would be European for this point alone. Im fairly optimistic for next season for the first time in a few yrs. Just goes to show that all it takes is investment to keep most of us happy.